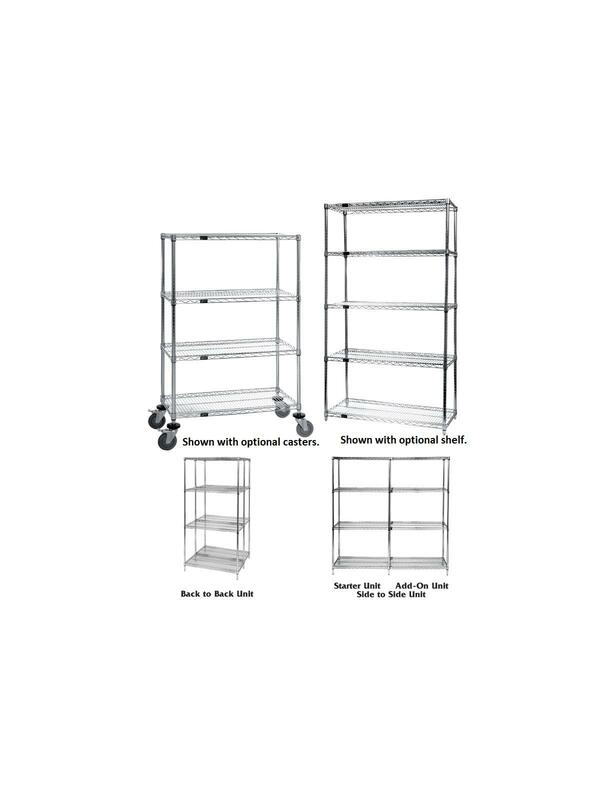 Min order of $125 within the continental U.S.A.
Wire shelving heavy-duty modular wire storage system offers a combination of shelf and post sizes to meet any applications. Split sleeve connectors with grooved numbered post allows for easy and quick assembly. 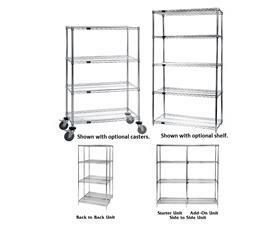 Shelves are constructed of all welded wire mats and supported with architectural wire trusses providing 800 lb. capacity per shelf. Leveling legs support each corner on stationary units and polyurethane non-marking casters can be added to mobilize unit. FOB Shipping Point. Easy rolling on polyurethane non-marking casters. HWR-00 Wt. 10 (lbs.) / Set 4. See chart below to order. May be purchased for the starter kits and add-on units. Available in 5 different widths in 12", 18” and 24” depths. Additional posts are available in 4 different heights. Please order S-Hooks if you purchase a shelf for an Add-On. Add-On Units include 2 posts, 4 shelves and 8 S-Hooks. Product No. Description Size Wt. Product No. Finish Description Wt.